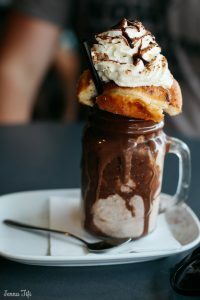 When you’re feeling an overwhelming craving for sweet, chocolaty, creamy indulgence, there is nothing more fitting then a Freak Shake. Whilst a relatively new obsession in the UK, Australia has been perfecting their creation for quite some time now, and it’s going to be near impossible to beat. 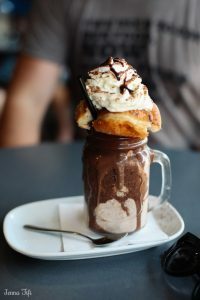 The Depot on Darby in Newcastle, NSW is one particular chocolaty hub of sins that has taken Freak Shakes to the next level. The urban restaurant is already a familiar haunt for Aussie foodies thanks to it’s scrumptious menu and attentive, friendly staff. 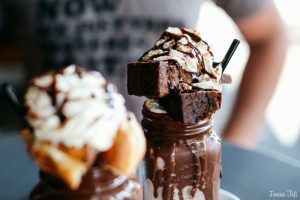 It’s new mouthwatering Freak Shake menu was the cherry (or brownie) on top. 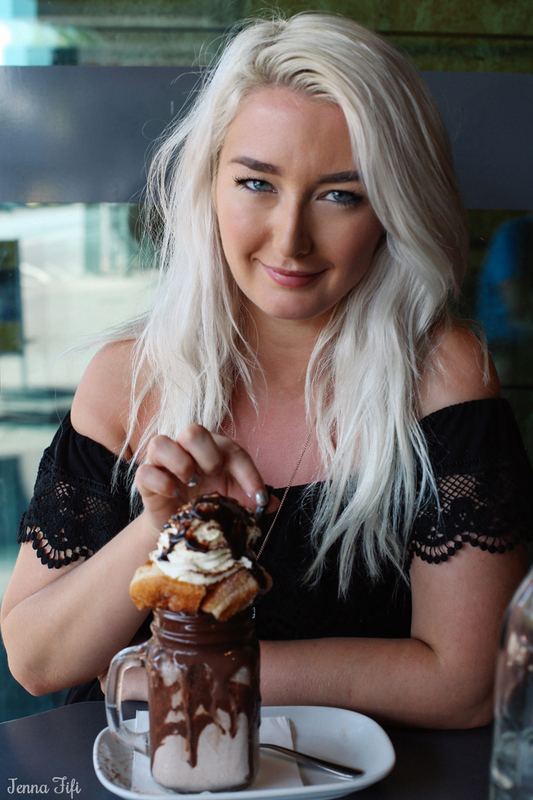 Fraser and I visited for our second Freak Shake lunch, we analysed the menu intensively. 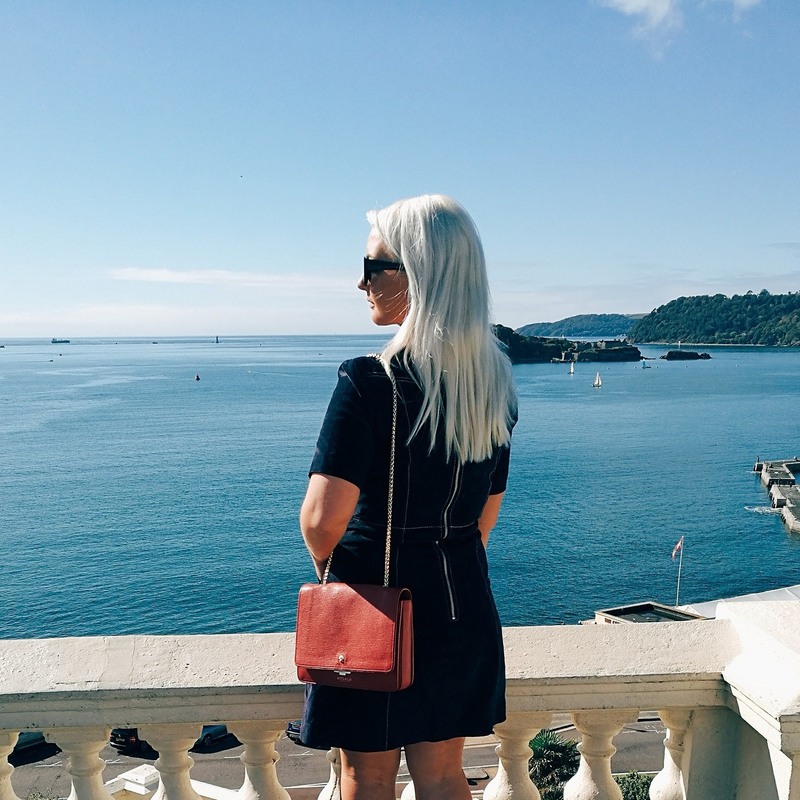 How could we possibly make a choice from the worlds most tantalising drinks menu? 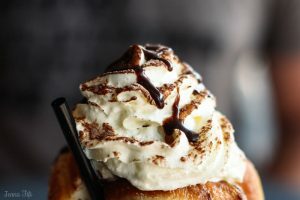 The salted caramel doughnut, the chocolate brownie, the Nutella doughnut, the ice-cream Neapolitan, the banana waffle, the strawberry shortcake or the churros Freak Shake? It read like a dream. 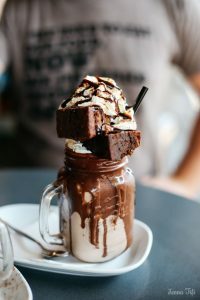 Chocolate took the front runner and eventually we decided on the Nutella doughnut and brownie freak shakes. 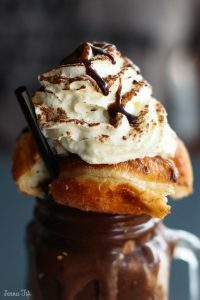 The Freak Shakes arrived in their almighty form; a milk, pastry and cream structure emblazoned with lashings of melted chocolate. Surrounding tables cooed and eyes widened as others ordered their Freak Shakes. 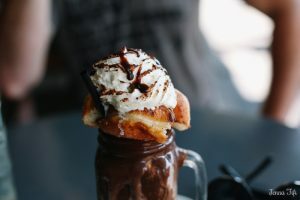 The shakes really are a meal in themselves, which makes them perfect for an alternative drink with the girls, or for a lunch date. At first it’s hard to know where to start, but that’s where the plate and spoon comes in. After all, this is no ordinary milkshake. 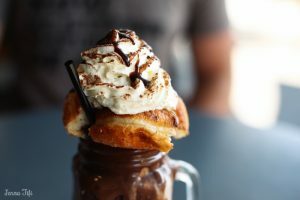 The chocolate sauce trickled down clouds of cream that was poised on top of a Nutella filled doughnut, underneath lay a glass of thick and delectable Nutella milkshake that was both refreshing and irresistible. It really was as good as it sounds. 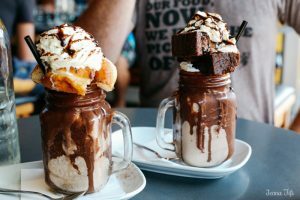 If you love milkshake (and who doesn’t?) topped with doughnuts, brownies, whipped cream and chocolate sauce then get comfy, snuggle up and enjoy the following photos. For those on a diet, look away now. 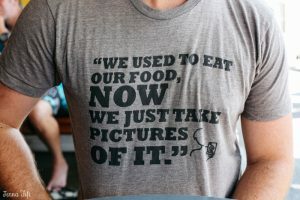 Fraser sneakily wore his new T-shirt to The Depot, knowing full well the Freak Shakes were worthy of an Instagram, or four. I only realised what it said after I’d taken lots of photos! If you or your partner feels my boyfriends pain, then the T-shirt is available to order from Instagram Husbands! If you find yourself seeking a cocoa euphoria, then I highly recommend a visit to The Depot on Darby for the most satisfying explosion of all things sweet and indulgent.